Severo worked nearly his entire career in Padua, a university city where patrons' appreciation for the classical past fueled demand for small-scale works like this one. It was probably loosely inspired by the Greek myth of Perseus, who rescued the beautiful Andromeda from the rock where she had been chained by a sea monster. Here, it is the god of the sea who has vanquished the sea monster, a few links of the chain by which he had tethered the beast still surviving in his left hand. The reworking of classical themes was a specialty of Severo's, who had probably the largest bronze workshop in Padua. In Neptune on a Sea Monster, some elements, including the monster's gaping mouth, seem to have been adapted from an engraving by another, earlier, northern Italian artist deeply inspired by antiquity, Andrea Mantegna. Neptune's carefully modeled, youthful body reveals the sculptor's command of anatomy and celebrates the god's eternal youth. His face, meanwhile, with deeply curling hair and beard, is that of an older man, who is more aware of the burdens of the world; this is a more common representation of the sea god. The head shows Severo's meticulous craftsmanship to advantage, as does the body of the sea monster, whose scales contrast with Neptune's smooth skin, and whose doggish ears and flippered paws show Severo's imaginative fantasy. Bucquet collection; (Jacques Seligmann, Paris); William Salomon [1852-1919], New York; (his estate sale, American Art Galleries, New York, 4-7 April 1923, 2nd day, no. 420, as by Bartolommeo Bellano); (Duveen Brothers, Inc., London and New York); inheritance from Estate of Peter A.B. Widener by gift through power of appointment of Joseph E. Widener, Elkins Park, Pennsylvania, after purchase by funds of the Estate; gift 1942 to NGA. 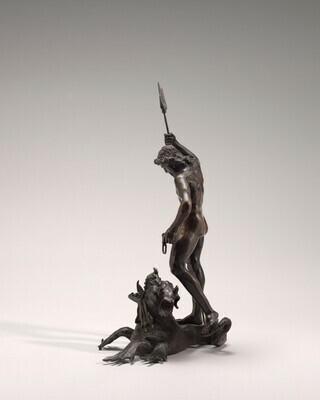 Master Bronzes Selected from Museums and Collections in America, Buffalo Fine Arts Academy, Albright Art Gallery, no. 128, repro. Antiquity in the Renaissance, Smith College Museum of Art, Northampton, Massachusetts, April-June 1978, no. 9. Severo Calzeta, called Severo da Ravenna, The Frick Collection, New York, June-October 1978, no. 13. Natur und Antike in der Renaissance, Städtische Galerie Liebieghaus, Frankfurt am Main, Federal Republic of Germany, 1985-1986, no. 138, repro. Circa 1492: Art in the Age of Exploration, National Gallery of Art, Washington, D.C., 1991-1992, not in cat. Rinascimento e Passione per L'Antico. Andrea Riccio e il suo tempo, Museo Castello del Buonconsiglio, Trento, 2008, no. 62, repro. Works of Art from the Widener Collection. Foreword by David Finley and John Walker. 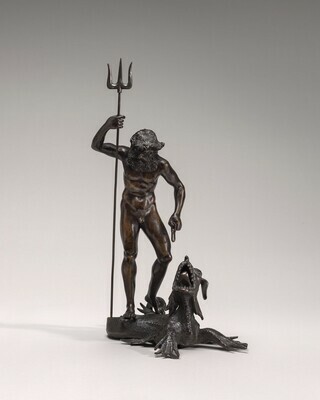 National Gallery of Art, Washington, 1942: 7, as Neptune and a Sea Monster. Paintings and Sculpture from the Widener Collection. National Gallery of Art, Washington, 1948 (reprinted 1959): 144, repro. Summary Catalogue of European Paintings and Sculpture. National Gallery of Art, Washington, 1965: 171. Mariacher, Giovanni. Bronzetti veneti del rinascimento. Vicenza, 1971: 30 no. 85, repro., as Neptune with a Dragon. 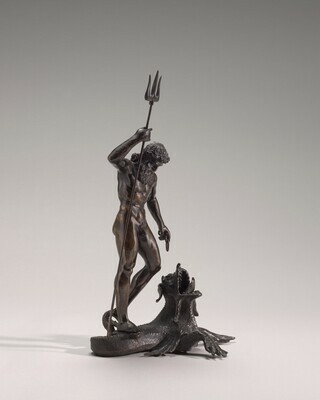 Wilson, Carolyn C. Renaissance Small Bronze Sculpture and Associated Decorative Arts at the National Gallery of Art. Washington, 1983: 69. Sculpture: An Illustrated Catalogue. National Gallery of Art, Washington, 1994: 217, repro. Augusti, Adriana, et al, eds. Donatello e il suo tempo: il bronzetto a Padova nel Quattrocento e nel Cinquecento. Exh. cat. Musei Civici, Padua, 2001: 154, 156. Darr, Alan, Peter Barnet, and Antonia Boström. Catalogue of Italian Sculptures in the Detroit Institute of Arts. 2 vols. London, 2002: 1:246. Luchs, Alison. The Mermaids of Venice: Fantastic Sea Creatures in Venetian Renaissance Art. Turnhout, Belgium, 2010: 158-159, 158 fig. 205, 220 n. 13. 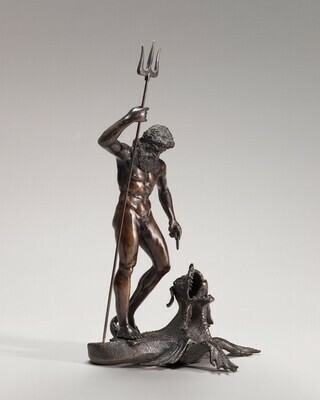 Dylan Smith, “Reconstructing the Casting Technique of Severo da Ravenna’s Neptune.” Facture : conservation, science, art history 1 (2013): 167-181.